Hallo Friends and Happy Easter to you! I wanted to share some upcoming live events and news happening this Spring. Next week I am heading to Germany to plays shows in "Picnic in Snow", an all new trio with Norbert Bürger guitar and Christian Schantz bass. If you are in the area come on out and we will be playing all new improvised music from my 2019 Songbook including songs from the "Tan Man's Hat". In May I am heading to Switzerland performing a few solo shows in Bruised by Noon part of a residency at the Uncoolfestival in the beautiful mountains of Poschiavo, Switzerland. I will be spending my time composing 8 new works for Drumavox, an all new project that merges myself on drum kit with an a cappella mixed Sardinian choir featuring Alice Madeddu soprano Eva Pagella alto Matteo Siddi tenor Manuel Cossu. I am really excited to compose and perform in this new configuration and continue to this special relationship that began when they performed my rock opera Zappanation. Check out below a little Easter Video featuring the choir and Matteo Siddi I recently received sponsorship from Sensory Percussion, a new interactive electro-acoustic sensor system for drum sets using contact microphones that I will be working with. Later in June I will head to Sardinia to rehearse and record these pieces in the recording studio. april 27 BarLiveMusikRaven, Straubing Germany (Picnic in Snow) Bar Livemusik Raven april 28 Schwarzer HahnHahn, Landshut, Germany (Picnic in Snow) may 3 kunstsalon maisach germany (Picnic in Snow) may 5 Kasheme, zurich, switzerland - (Bruised by Noon Solo) may 24 BAR CAFFÈ PEDENOSSO, Pedenosso, Italy - (Bruised by Noon Solo) may 25 Casa Hasler, Poschiavo, Switzerland - (Bruised by Noon Solo) june 6 kv roeda, styr, austria (Picnic in Snow) june 8 Furtnerers, freising, germany (Picnic in Snow) june 9 Immerhin Würzburgin, wurzburg, germany (Picnic in Snow) #PicnicinSnow #Drumavox #SensoryPercussion Sunhouse #Sardinia #Zappanation #PaveesDance #bruisedbynoon Guenter Janovsky RareNoise Ligeti Quartet #FrankZappa https://youtu.be/IntGg422KMk 1 day 15 hours ago. Sean Noonan Music shared a photo. 3 days 10 hours ago. Luminous Dash review of #TanMansHat and Bootsie Butsenzeller gets it right about my influence from #Animal was my first encounter with music as a 5 year old. Thanks Bootsie and I got an animal t-shirt for you next time me meet! He looks a lot like you. RareNoise https://luminousdash.be/reviews/sean-noonan-pavees-dance-tan-mans-hat-rare-noise-records/?fbclid=IwAR1t_1FUIvNiM0d61L6eHRRV9awRM7zyUHzqkh77nBhjvAjj0xJ8_vthNj4 3 days 14 hours ago. Sean Noonan Music shared a post. 1 week 7 hours ago. Today in my practice studio I finally was able to play both of my drum kits Troyan Zachow Drums and Eames Drum Company. I have been loyally playing the custom made Eames since 1995 and you can hear it on #TanMansHat album. The Troyan snare is a custom Sean Noonan signature snare that is a solid state shell divided into three different types of wood. I encourage all drummers out there to spend your money on small independent instrument makers like these guys and support them and you will hear a different in the sound for sure! 1 week 5 days ago. Imagine if Charles Ives sat in on a set with Slayer. Envision Busta Rhymes trapped in a high-rise elevator with Muzac blaring from the overhead speakers. Put another way: THE HUB is a band whose appetite for far flung sounds often defies categorization and whose members play with the conviction and ferocity of men on a mission. Straight out of the underground music scene in Brooklyn, this avant-garde trio consists of Dan Magay on alto sax, Tim Dahl on electric bass, and Sean Noonan on drums. 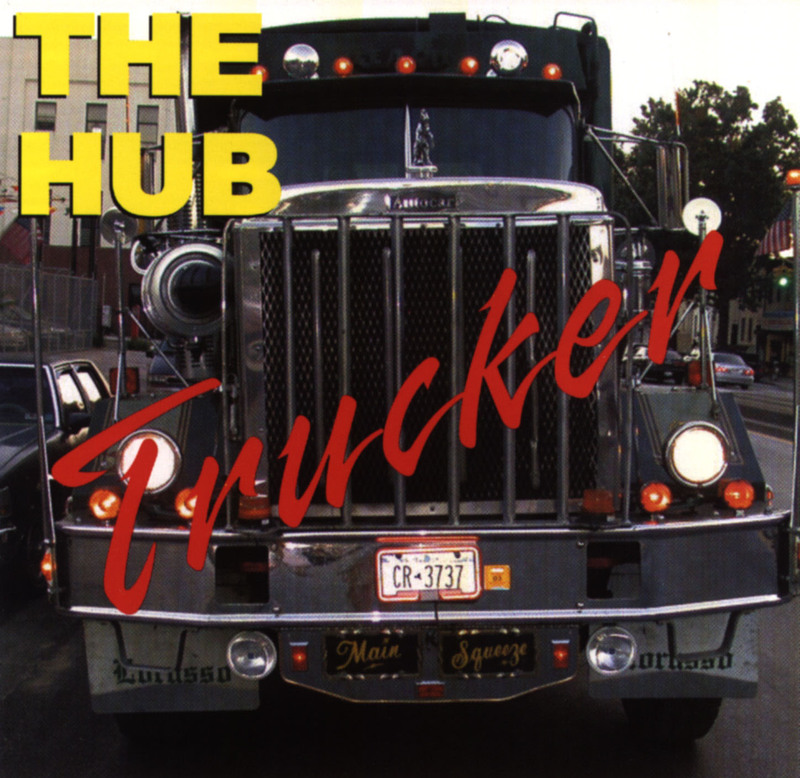 With “Trucker” the boys take another existential leap by creating a sonic amalgam of punk, new wave, metal, funk, and freeform jazz improvisation. So… What is THE HUB? They’re an irresistible force for progressive music listeners everywhere.